We haven’t had an Inexplicable Photo Caption Contest in a few months, but we’re doing it now because this photo just screams out for one. No prizes. No winners. 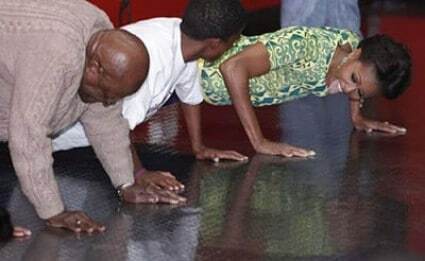 Just the warm inner glow you get when you know you’ve come up with a funny caption to accompany a photo of Michelle Obama sticking her tongue out at Desmond Tutu while they both appear to be doing push ups. Make ’em funny or don’t make ’em at all. Dam.n, woman!……That one smelled purple! After searching for the take home line on his latest Shared Sacrifices paycheck, Desmond Tutu delivers the classic line, ” Where’s the net ?”. What kinda f’ed up game of Twister is this! Where are the damn colored circles! Oh, Desmond, I was so poor as a kid, we had to make ’em with our tongues! >> Ok. I should have waited until happy hour to write this. Push ups or afternoon salah? This is too hard – are you sure the muslims don’t keep their knees on the floor when praying to allah. so this is what the taxpayers do to pay for my vacations,”bend over and grab the vaseline”! Barack likes to bow down… but I’m practicing prostrating myself for when the Caliphate REALLY kicks in! We lick the floor before his Excellency passes by. Sorry, I couldn’t help myself!! Now that I’ve done my weekly pushup, where are the fatcakes and fries? I have licked this entire floor once already and still haven’t found my contact. I don’t see the President’s economic recovery plan over here either. Since Barry’s not here to bow to you…. Michelle:”So this is how you gonna lick Barack’s golf shoes next time he visits his native country”. In a scene from “Genius’ at play”, confusion over the game of Twister became apparent when someone discoverd the pokedot mat still in the box.